And, we’re back! I’ve done two rounds of Seven Deadly Sins prompts, mostly because I have such a large pool of characters to draw from. While flipping through other prompt suggestions, I happened to find a list of the Seven Heavenly Virtues (which seem to get a lot less press). In case you’ve never heard of them, they are: Chastity, Temperance, Charity, Diligence, Patience, Kindness and Humility. So now that we’ve seen the darker sides of my characters, why don’t we take a peek at their virtues? Next up is Domerin, whose virtue is actually the exact opposite of his vice. Temperance; moderation or self-restraint in action, statement, etc. ; self-control. Every time someone asked Domerin Lorcasf if it was really the best idea to raise a child on a mercenary ship, he answered no. He didn’t hesitate. He didn’t think about it. He didn’t really need to. Mercenaries tended to be a ragtag group of outcasts to begin with – it was practically a requirement of the job. But Domerin’s were rowdier than most and he was never more keenly aware of that distinction than when his daughter was around. Whenever the question came up, Domerin expected a lecture about stability, consistency and ethics. But instead the inquirer inevitably pressed their lips into a thin line and went on as if the topic had never come up. Perhaps the school officials and doctors who dealt with him were so used to push back from wildly confident parents, secure in the knowledge that they knew best for their child, they were simply unprepared to deal with someone who knew they were in over their head. On the one hand, it was a relief. He was ill-equipped to handle lectures, more used to delivering them these days. On the other, he would have appreciated some advice. He was always the first to admit that the safety and stability of her aunt’s ranch would have suited Robin’s upbringing best. But the girl thrived off of their blood connection, and sending her back to all the bad memories of her mother’s end seemed more damaging than a few crass statements and the tendency of those surrounding her to solve their problems with punches. “I encourage her,” Domerin replied, not sure what else he was supposed to say. It was up to Robin what she ultimately decided to study. He wasn’t going to push her, even if experts thought he should. As far as he knew, she wanted to be a veterinarian, and since that was likely to take her back to the out of the way foothills of her home planet, Domerin certainly wasn’t going to stop her. The clerk made a soft sound that might have been approval, but Domerin was too distracted by the severe bunching of her lips to say for sure. She spent entirely too much time straightening the sheets of paper which contained his daughter’s official reports – a copy of which had already been emailed to him, but would not be accepted by other schools. For some reason, they all wanted hard copies, a bizarre and illogical throwback to an older age. At last, the clerk was satisfied all the pages corners lined up and she slid the plastic sheets into a bright red envelope, so colored – he imagined – so that he’d never be able to lose it. After accepting the packet, he stood for several seconds, expecting to be interrogated further as to whether or not he was certain he could handle a child his daughter’s age, if he wanted to enroll her permanently in boarding school, or perhaps simply give her up to adoption and admit he was entirely inadequate as a parent. But when the woman said nothing else, he thanked her and left. It wasn’t as if he didn’t have other things to worry about. They were due for liftoff in less than three hours and he had spent more time than he anticipated navigating the school’s office. Luckily Rilan had been able to take Robin back to the ship, or Domerin might have gone half-mad trying to answer all of her impatient questions while the hours ticked away. 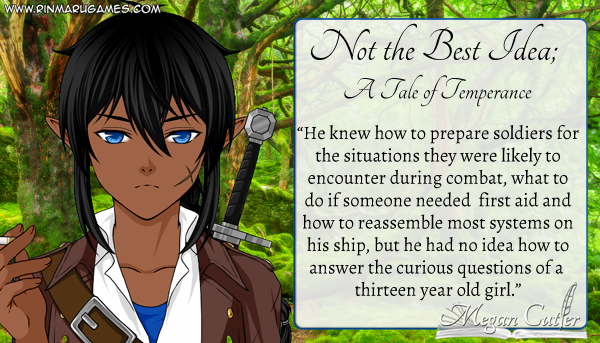 He knew how to prepare soldiers for the situations they were likely to encounter during combat, what to do if someone needed first aid and how to disassemble and reassemble most of the systems on his ship, but he had no idea how he was supposed to answer the curious questions of a thirteen year old girl. Especially when he knew almost nothing about girls at that age. They were on a tight timeline, expected to rendezvous with their latest client in forty hours, and their late departure didn’t leave them much time to deal with unexpected delays. But this was hardly his first rodeo and there were ways to stretch their travel window, if he had to. He expected the last cargo shipment to be loaded by the time he arrived. With three shuttles transporting supplies into orbit, the crew should have been able to finish early. But two of the shuttles sat empty, their doors open and their ramps extended, the boxes they were meant to carry still sitting on pallets nearby. Domerin glanced at his watch and then rubbed his temples, hoping to stave off the first hint of a headache lurking beneath his skin. “Yes,” Rilan replied, as if this was what he had been trying to explain all along. A few feet away, Robin cringed and disappeared back into the shuttle cockpit. Not that it would prevent her from hearing the rest of the conversation if she really wanted to. “Rilan, I do not have time for games right now.” More than just the warning hint in his tone, Domerin narrowed his eyes and took a half-step closer to his second in command so the man would know how close he was to his breaking point. Not that he would have punched Rilan, but the next member of his crew to pass within arm’s length might not be so lucky. It was altogether more difficult to keep from cracking skulls since Robin had come aboard. And coincidentally, the situations which caused him to lose patience with his crew often originated with her. “Excellent,” Domerin grumbled. It would take an hour to load the shuttles by the time his crew got back and that wouldn’t leave them enough time for both the preflight checks and the inspection. And he had long ago learned never to skip a preflight check unless his life depended on immediate departure. “Are you mad?” Robin’s small voice startled him out of his temper. Robin slunk to the far end of the room to retrieve a large shovel, and Domerin got the impression she had already been forced to clean quite a few messes before his arrival. He didn’t like to consider himself a superstitious man but, since bringing his daughter home with him, he had learned that bad luck formed a string. A seemingly innocuous delay without children often passed with relatively little fuss, but combining the same scenario with a single child compounded the trouble significantly. Sometimes it took several days for everything to settle back down, as he suspected the case was likely to be this time. So he was prepared for the haughty inspector, who found problems where there were none and wanted to ground his shuttles an extra three hours before he would agree to let them launch. And Domerin bit his tongue, held onto his polite nature and managed to talk some sense into the man without having to slip him a bribe – one practice he didn’t want to become known for. And he was ready for the engine diagnostic gone awry that kept one of his ships from departing at full power when he finally did get back into space, his errant daughter in toe. He was not prepared for the conversation about why Robin had tried to smuggle horses onto his ship and why, subsequently, she would be grounded for the next two weeks. He hated the way she pouted at him, her eyes wide like a puppy that’s just been kicked. Her unhappiness never sat well with him, but he couldn’t be her friend when she’d done something wrong. By the time the fight broke out in the mess – and in front of his impressionable daughter to boot – Domerin’s temper was on its last thin thread. He wanted nothing more than to grab the instigator by the collar and bash his head against the nearest table to prove his point. His fingers curled into a fist at his side just thinking about it. But he could feel his daughter’s gaze staring up at him, probably wondering if he was about to ground a chunk of his crew for three weeks for the black eyes and bloody lips they exchanged before his sharp rebuke dragged them apart. He had never been above using force against his crew when he thought a situation warranted it, but he was trying to teach his daughter to fight her battles with words. “We’re sorry, Commander…” One of the fighters started, but fell silent when Domerin’s sharp gaze fell on him. “We regret causing you trouble,” another murmured, head bowed, eyes on the floor. “You will when you’re finished running laps in full combat gear,” Domerin growled. He turned and guided his daughter toward the serving line, a clear indication the conversation was at an end. But his temples throbbed by now, a harder and faster beat than the rhythm housed in his chest. It was all he could do to keep from chewing everyone’s ear off; venting his spleen wasn’t going to get the work done faster and it was better to save his ire for those who deserved it. When at last, he got Robin settled into bed for the night, he allowed himself to indulge in a single glass of whiskey – the good stuff – a soothing balm for his building temper. He tried to remind himself that the good days outweighed the bad ones, and that the end result would be worth all the struggle. Not to mention the fact that he had, somehow, survived most of his life without murdering the people who pissed him off. The trouble, he was forced to admit, was lack of confidence. He never questioned his command decisions, but everything about fatherhood seemed coupled with the imminent threat of ruining his child’s life. And it was so much easier to relieve the build of pressure against the smaller issues that seemed so simply cut and dry. But it wouldn’t have set a good example. Nor would it have been fair. And while Domerin Lorcasf was more keenly aware than most of how unfair the universe could be, he wasn’t about to compound the problem. He would just have to find his way through, keep a tight rein on his temper and hope for the best. Bolstered by the slight taming of his headache, Domerin poured himself one more glass of whiskey. If nothing else, it would help him sleep.